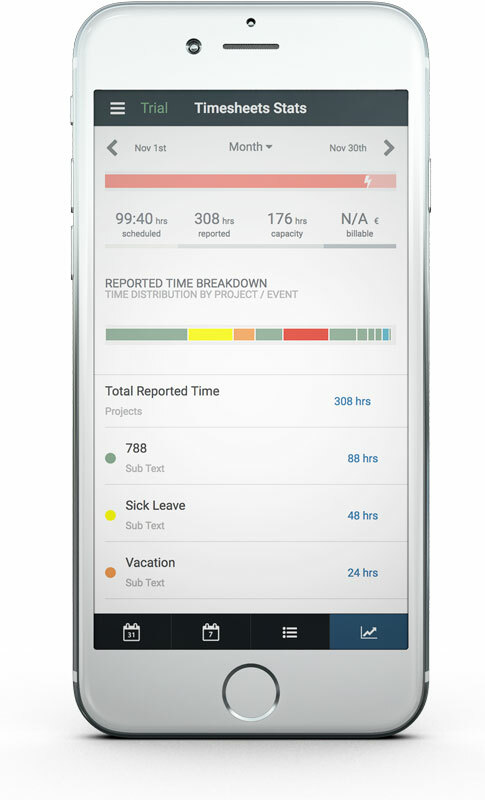 Hub Planner Timesheets gives you a full time-tracking module integrated right into your account, allowing your team report Actual Time on Projects and Events. The slickly designed Timesheets component extends the power of our Resource Planning Scheduling tool and Reports by giving you the full picture of scheduled time versus actual time. Watch your project plan go full circle. Booked / Scheduled time is automatically fed into every resources timesheet in real time as a suggestion. Therefore they always know the latest projects they are assigned to and what time they are booked. They have the option to confirm this time or enter an alternative. Using timesheets on the phone is really simple. The web based application has a native experience, allowing team members to get a great overview of their month, easily insert time and review what they have done so far. Usability is at the forefront of every feature discussion here at Hub Planner. Timesheets is executed with that in mind and we have taken steps to ensure that the timesheets is intuitive and makes the effort of time tracking effortless and rewarding. An accordion style menu allows you to quickly deep dive into a project or category and be able to quickly see where you time is being spent. The system smartly suggests time to each user based on what projects or events they are scheduled on. There is a quick option to accept this time by clicking on the input, or the user can choose to enter any number of hours they want. In addition to the main charts / graphs available for your timesheets dashboard, there are also small progress charts available beside each resource and category. The arrows and charts are colored to let the user know if they have reported less time than they have been scheduled, on track or over reported time. Each booking with Hub Planner has a default booking category associated with it. You can create as many booking categories as you like which are niche to your workflow and business terminology. Resources can report time on Projects using these categories to create more meaningful reports and clearer transparency of where the time was spent or allocated.